I was so very appreciative that I finally got to experience it. Tree branches were no longer just green colored arms sticking out of a tree; they were suddenly branches that had beautiful vibrant individual green leaves on them. Flowering plants weren’t just a blob of color anymore; they were a beautiful living creation from God, with their own blooms and leaves, and little bugs that crawl on their petals. Want know what Karen is referring to? Read the beginning of Karen’s story here. This may sound absolutely absurd to some of you, however, I felt like I had just been born and was seeing the world for the first time. Even when I looked in the mirror I saw a totally different person. I had an idea of how I looked but what I seen was something completely different. Still gorgeous, of course, but with a lot more lines and spots and details that I never knew existed. I could actually see other people’s expressions while having a conversation. I believe that is why, to this day, that I can read people quite easily. When you can’t see and then suddenly you can, it makes a HUGE difference in the things you pick up on. After adjusting to my new lenses, (contacts) I still had to sit close to the chalk board in school and I still didn’t have the vision that everyone else had, however, I was so grateful for the improvement that I experienced that I didn’t really care. It was a whole new world for me and I loved it. When you wear contacts you have to make a decision as to seeing up close or far away. In later years when I got a job and worked mostly on a computer, I decided it was most necessary to see close up to be able to perform my job to the best of my ability. By choosing this option it meant that I would then need to have normal glasses that I would put on over my contacts to be able to see far away. All of this is fine until of course, it isn’t. Since my eyes have adjusted to seeing close up, even though I no longer work, I left my prescription the same, which means that I have regular glasses to put on over my contacts for driving purposes or seeing far away. My vision isn’t as sharp as it was that day I walked out of the Doctor’s office; however, I still have feelings of joy for what I am able to see. Over a decade later, my Brother had gotten married and started a very active lifestyle. He decided that he just wanted the doom that has always been hanging over his head about having surgery one day to be over with so he could enjoy his life with his new wife. He elected to have the surgery done before it got into the danger zone. He figured this would be no big deal since our dad had this surgery done years prior and came out just fine. He took into consideration all the medical advances and decided this would be the smart thing to do. I think we all just assumed it would be okay because Spectrum Hospital is one of the main hospitals in Grand Rapids, Michigan and is home to so many great Doctor’s, including the one that saved my Dad’s life. The problem with our way of thinking is that we all were oblivious to how fortunate we were to be referred to the surgeon that operated on my Dad. He was a VERY talented man that had experience with operating on Marfan patients. At the time, we were not aware of how important that factor was. My Brother had chosen a doctor at Spectrum that was a very good heart surgeon; however, he lacked the necessary knowledge of working with a Marfan patient. This was at a time when you didn’t have to be your own advocate because you could count on the doctor’s to know what was best. The Doctor made it sound pretty simple and even gave my Brother a mere 1% chance of NOT surviving. Sadly, we were all slammed in the face with the terrible outcome. Due to the lack of knowledge on the Doctor’s end, my Brother hemorrhaged after surgery and passed away. After the fact, the Doctor acknowledged his mistakes but unfortunately it doesn’t bring back our Husband, Son, Brother or Uncle. He passed away only a year and a half after getting married and he was only 33 years old. I had always feared the day when my surgery would roll around but especially after the passing of my brother, I was petrified. I began to do all kinds of research into Marfan’s and into the surgery itself, so that when my time came, I would feel 100% confident. I discovered that my Brother should never have been able to have “elective” surgery to begin with. He especially shouldn’t have been having the Valve-sparing surgery because there were only a handful of doctor’s around the world that even qualified to do that surgery. I also found out the importance of having a skilled and knowledgeable surgeon that has history with Marfan patients. This is what brought me to University of Michigan Hospital in Ann Arbor, Michigan. For both of my surgeries I had qualified surgeons who are now added to my “Hero List” alongside my Dad and his surgeon. My Brother’s death changed our family in more permanent ways then you can imagine, however, in my eyes my Brother saved my life. Had it not been for his death, I would have gone blindly into surgery just like he did, and I’m guessing that I wouldn’t be here right now to raise awareness. That just makes my mission in life all the more important. I have to be here to teach the world about Marfan Syndrome, being your own advocate, living each day to its fullest, having a positive attitude at all times and knowing that YOU know your body better than ANYONE. Throughout these years, my Dad also came up against some other issues related mostly to complications with blood thinners and surgical procedures. He almost died once after having a Colonoscopy where the bleeding wouldn’t stop. He also developed a hematoma after having stents put in. He had a detached retina that left him 99% blind in that eye and many many other issues as well. The older we are now: My Dad 73 and I am 40, the more daily issues we have. I had aortic repair/valve sparing surgery in October of 2008 and while recovering from that I popped a couple chordae tendons on my mitral valve and had to have Mitral Valve surgery in April of 2009. Fast forward to 2012, where I had a detached retina and lost most of my sight out of that eye which then in turn caused me to have to file for Social Security Disability at age 38. I had applied once after my first heart surgery but got denied and thankfully after having to quit my job of 10 years in 2012, I applied again and got approved, thanks to my Attorney that specializes in helping people with Connective Tissue Diseases get Social Security. Our lives have been anything but dull or boring but through it all we all managed to keep our goofy sense of humor and our positive attitude. 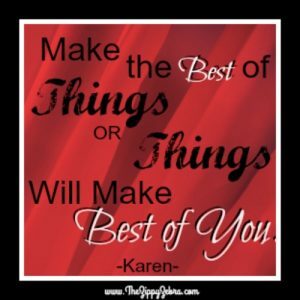 I just figure that you basically have two choices in life; Make the best of things or things will make the best of you. 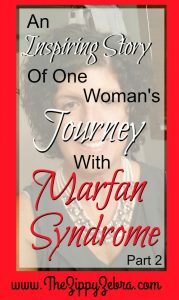 Marfan is going to happen whether we like it or not so why not have a good attitude about it. Besides that, if it wouldn’t have been for Marfan Syndrome I could have been one of those self-obsessed teenage girls involved in drama and putting other people down that may be just a little different than myself. No thank you. 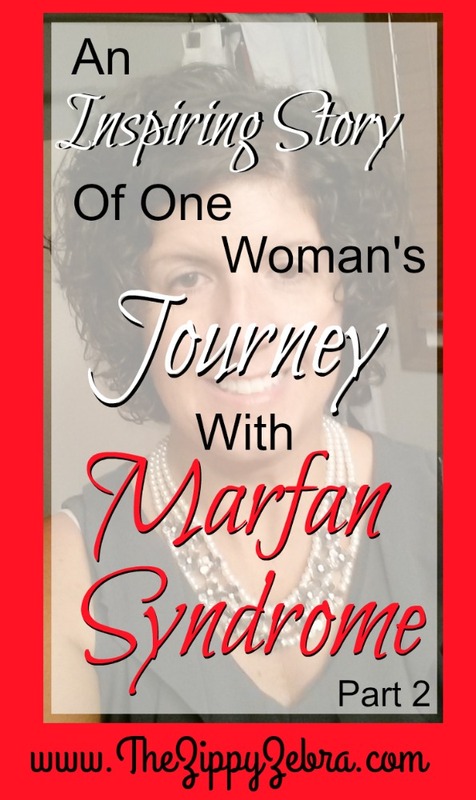 I’ll take Marfan Syndrome any day! Did you enjoy reading Karen’s story? Do you have one of your own? We are accepting submissions from anyone with a story about chronic/invisible illness or physical challenges. Please click this link http://thezippyzebra.com/?page_id=790 for more details. For more great chronic illness journeys, stories and information follow us on Facebook, Pinterest and sign up for weekly emails. NOTE: Items in blue are links to informational posts. Hover over the word then double click to open for more info.